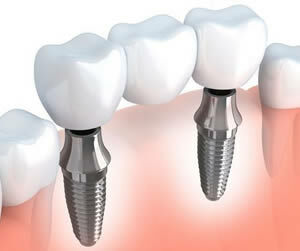 There are various types of dental implant restorations. This includes crowns, all on 4, bridges, and/or fixed dentures. Dental implants are favored over bridges and dentures as they are seen as a permanent and aesthetic solution to the problem of missing teeth. Plus they are strong and durable. A restoration can involve a single tooth or several teeth, many of which can be attached to a single implant. The implant is inserted into the jaw and allowed to fuse with the bone in a process called osseointegration. This process takes anywhere from 3 to 6 months. Once the gum has healed and fusion has taken place the implant is then ready for the attachment of a metal abutment. This device acts as an anchor for the restoration. There are several types of abutments which are designed to blend in with your natural teeth. The dentist will take an impression of your teeth using a mold which contains dental putty. You will be asked to bite into this putty so that the dentist has an imprint of your teeth. This impression is sent to our in-house laboratory to produce your new restoration. This process is the same for both a single crown and multiple crowns. The process is the same as mentioned above but with one difference. This involves the creation of several crowns which are then fixed to a bridge. A bridge consists of a false tooth known as a pontic and two or more crowns (restorations) which are attached either side of it. This bridge slots into the space between your teeth caused by tooth loss and is supported by the other teeth. The big difference between this and ordinary dentures is that a fixed bridge is cemented in place and cannot be removed each night. A denture is a device worn in the mouth to replace missing teeth. It can replace a few or all of your teeth. It consists of a plate with artificial teeth (restorations) attached to it and is worn on a daily basis. But one of the problems with a denture is that of clicking noises or shifting around in the mouth. There are people who have badly fitting dentures or find that they have become lose, often due to changes in their jaw as part of the ageing process. One solution is a denture which is fixed in place with a dental implant. This is similar to a fixed bridge and removes the need to remove the dentures at night for soaking before replacing them in the morning. The advantages of an implant retained denture are the reduced risk of trapped food particles underneath the plate which can lead to an infection: no risk of sores developing caused by friction of the denture: strong and lifelike: plus this is customised to your individual requirements. All-on-4 implants are a permanent set of fabricated teeth set on dental implants surgically placed into your jaw. They look, feel, and function like natural teeth.